Here we have a series of images showing a cut-away of a Hollow Core Photonic BandGap Fibre neck-down, as generated by a numerical simulation. The wide preform is drawn down to a slender fibre in a furnace. The outer glass is coloured to show temperature, the microstructure is coloured to show the whether surface tension (blue) or pressure (red) dominates. 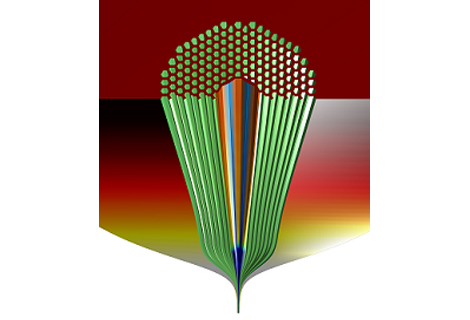 Cut-away of a Hollow Core – Photonic BandGap Fibre neck-down by Dr Greg Jasion, Research Fellow. This is the first ever numerical model produced by PhD students within the ORC that is able to predict the draw dynamics of these kinds of fibres, it has shed light on how the fibre structures develop during fabrication. We can use the model to assist in fabrication of more advanced fibres. These fibres have numerous uses in the real world, such as: gas sensing, low latency communications and frequency metrology. The work is part of the ModeGap project and the Microstructured Fibre group. ModeGap is a Collaborative European project who’s aim is to develop the disruptive technology and concepts needed to enhance our communications infrastructure 100-fold to avert network gridlock and reduce energy consumption. The work behind this image was presented at ECOC 2014 in September. The Optoelectronics Research Centre holds its annual 'Brilliance' competition, to celebrate the beauty and novelty of our research into light and it’s applications. The objective is to show the beautiful, novel and sometimes whimsical side of the technological advances our research brings.